America is fortunate to have plentiful natural resource reserves underneath it. From Alaska, to Pennsylvania, we’ve discovered large amounts of accessible oil and gas reserves. 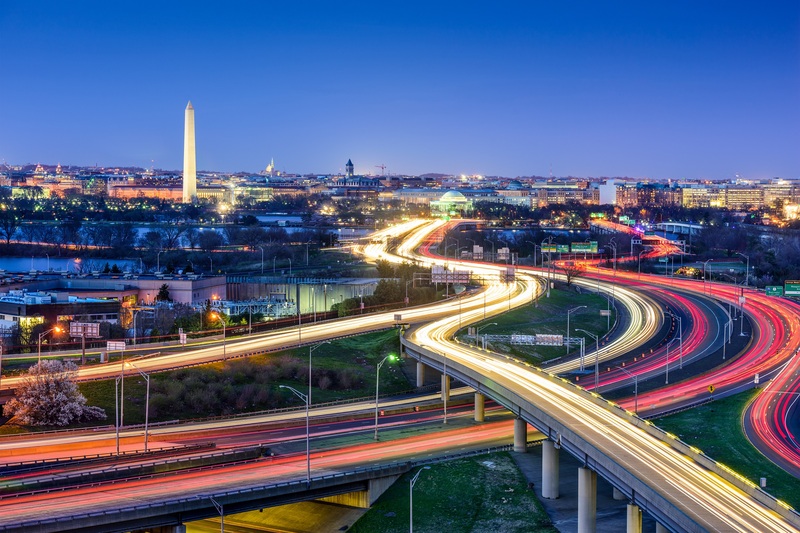 Thanks to significant advances in hydraulic fracturing and other drilling technologies, the United States is able to take advantage of this abundant supply of oil and gas resources and use it to power our nation. Although many think of the volume of natural resources in any given area as a finite number, the amount of “proved reserves” changes over time because they are “estimated volumes of hydrocarbon resources that analysis of geologic an engineering data demonstrates with reasonable certainty are recoverable under existing economic and operating conditions.” In addition to increasing due to improvements in technology, the amount of proved reserves can increase when the price of oil and gas increases, because it is then considered economical to access those resources. According to the Energy Information Administration (EIA) proved reserves of oil and gas are double what they were a decade ago. 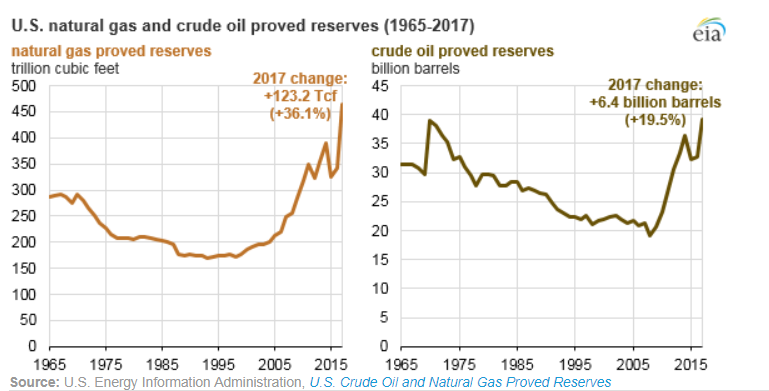 In 2017, the proved reserves of oil in the United States reached 39 billion barrels, breaking a 47 year old record. Proved reserves of natural gas also reached record levels in 2017 to 464.3 trillion cubic feet, a 36.1% increase over 2016 levels. To get a sense of how long these resources could power demand, it is important to look at “technically recoverable resources” or oil and gas that can be produced using currently available technology and industry practices. 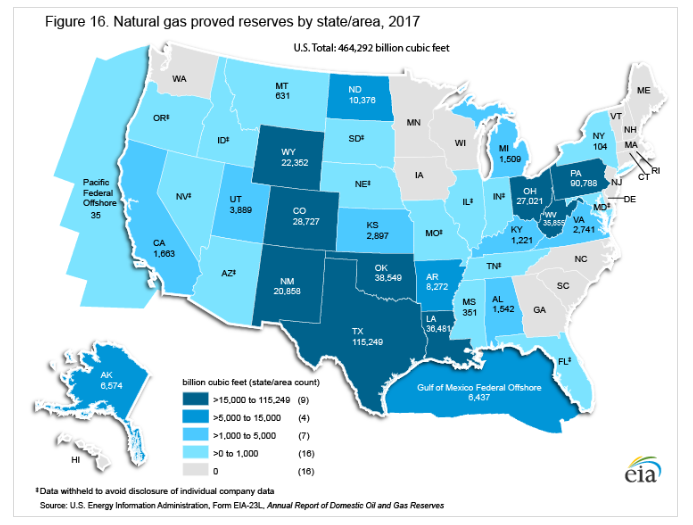 To put these numbers into context, according to the EIA, the United States has enough technically recoverable natural gas to last another 90 years if we consumed gas at the same rate as we in 2016 each over that time period. 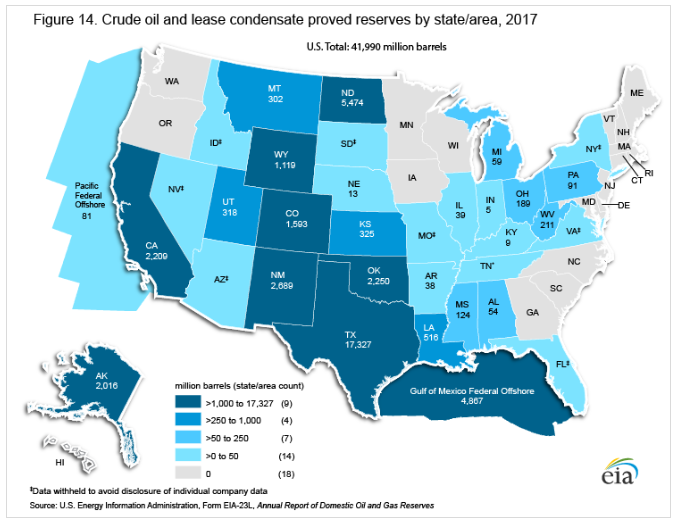 Meanwhile, analysis from Rystad Energy found that the United States has enough technically recoverable oil to last another 79 years at present output levels. Where in the US is the Oil and Gas? Plentiful natural resources combined with impressive technological advances have allowed our nation to become more energy independent than ever before. AXPC members work hard to ensure that the resources are produced in a responsible, efficient and economic way, ensuring that Americans will see the benefits of oil and gas for many years to come.